You can crush the wheat and rye finely and not worry. I like this recipe for two reasons. First of all, it’s a tasty beer with low alcohol and low calories. Second, it’s a beer that professional brewers would be hard-pressed to duplicate. Malted wheat and malted rye are notoriously sticky – especially the rye, which I discovered can be quite viscous. The advantage to the viscosity is that we can use rye to boost the body of low gravity beers to make them less watery and more substantial. I use a couple of nifty tricks in brewing this beer that are, again, in the homebrewers’ advantage. I avoid a stuck mash tun by using brew in a bag (BIAB) approach, and I maintain the temperature of my small mash by putting it into my electric smoker. The recipe is quite simple. The grain bill for a five gallon (19 liter) batch consists of only three pounds (1.4 kilograms) of malted wheat and one pound (0.45 kilograms) of malted rye. In the original version of this recipe, I only added a small amount of bittering hops to the boil and dry hopped in the keg. In this week’s brew, I added a late-hop addition to the bittering hops. I haven’t decided whether I’ll dry hop (but chances are that I will). I used Safbrew T-58 to ferment the first beer. In this one, I went with the more neutral Safale US-05. I’m curious to taste the difference. 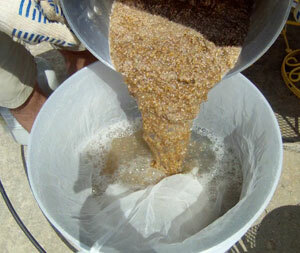 After the mash rest, the mash is poured into the sparge water in the bag-lined kettle. The first time I brewed this recipe, my pre-boil volume was a little low. I ended up with an original gravity of 1.020, which finished out at 1.004 – giving the beer an alcohol by volume of 2.1%. This time, I raised the level of the pre-boil volume and achieved an original gravity of 1.018. The original beer was fairly delicate, but satisfying. Even Andy Sparks, noted hophead and lover of big beers (and small), said he was impressed by the hop character. I’m looking forward to tasting how this version turns out. Below is the recipe for this week’s brew and the Basic Brewing Video episode featuring the first attempt. I’ll keep you posted when the beer is finished. Pour 8 quarts (7.5 liters) filtered water into a pot large enough to hold the mash, but small enough to fit into an electric smoker. (You don’t have to use an electric smoker, but I find it’s a great way to hold the mash rest temperature of a small mash.) Bring the water up to 163˚F (73˚C) and add the grain. Rest at 153˚F (67˚C) for one hour by putting the pot into the smoker, which has been warmed up to the rest temperature. In the meantime, bring five gallons (19 liters) of filtered water to 170˚F (77˚C) in the main brew pot. At the end of the mash rest, line the larger brew pot with a Brew in a Bag nylon bag. Pour the mash from the small pot into the larger pot. 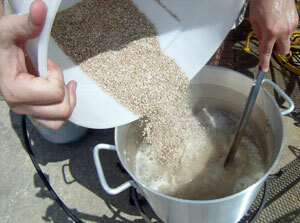 Stir the grain and water, then remove the bag – squeezing to extract the last of the wort. Bring the wort to a boil and add bittering hops. After an hour-long boil, turn off the heat and add the aroma hops. Chill, then pitch yeast. Add dry hops in the keg (or in a secondary) if you like. We brewed this beer about a year ago and ended up splitting the batch and trying Safale 05 and Safale 04. Personally I didn’t detect a big difference between the two. Our beer weighed in at about 2% ABV (I don’t remember the OG etc). Give the beer the the time it needs to condition and improve the flavour. This is one tasty beer with just enough Rye to give a good punch. Our preference was to add a twist of lemon in the glass. I passed your recipe on to a novice brewer who brewed an excellent batch as well. A great summer beer. That’s great! I’m glad you guys enjoyed the recipe. I’m looking forward to seeing how the hops added to the end of the boil will differ from the dry hopped batch. That’s good info about the lack of difference between the two yeast strains. I think that makes sense. Isn’t yeast character roughly proportional to abv, since yeast byproducts that give flavor and aroma are produced during fermentation? Though I’m sure you could find a yeast that produces noticeable character in a OG 1.020 brew! Good point. That would be a fun experiment to do two similar beers of different gravities to compare and contrast. how long did this ferment? any idea about what temperature? I bottled a little over a week after brewing. I believe my basement was around 68F. James, I may have missed it, but did you get any close up footage of the Carbonation in the 100% Rye beer? I would love to see the “Slow” Carbonation. I didn’t get any closeups of that. There is only one bottle left in the world. I need to document that. . . and/or brew another. Would scaling this down to a 1 gallon batch be as simple and dividing the grain bill by 1/5th? The biggest difference I can see in scaling recipes up and down is the amount of water used. In smaller batches, the boil off rate is proportionally larger. The IBUs seem really low on this beer. (~13IBUs)? It tastes balanced – especially when dry hopping in the keg. Hi. I tryed belle saison yeast in a low abv brew and the s04. Both nice, but the saison was very good. Much fresher tast. Thinking of trying your recepi, but with saison yeast.. thanks for a great show. Cool. Let us know how it turns out. Thanks for this recipe. I’m brewing it now, with some alterations in the hops. I also added some dried sweet orange peel that I’ve had lying around for ages. It smells real nice. Should be a refreshing summer beer. And it turned out great! At least for such a low ABV beer. This will be perfect for this summer, because I am expecting it to be a super warm one this year. 😀 Thanks again for sharing. Cheers! James – How did the second attempt with flame out hops turn out? Well, I had a bash at the Rye Wit recipe, as specced for the NZ Home-brewers’ Conference, and it worked a treat. The rye/wheat combo does indeed lend it a substantial mouthfeel, as well as a nice bready maltiness. I think I was a little too timid with the hops, and it has a slightly unusual ‘lemon juice’ finish. It’s hard to describe because it’s not a sour flavour. It’s almost a ‘minerally’ flavour but I recognise it as a flavour in home-made lemonade – possibly a similar bitterness to lemon pith? I was interested to see an earlier poster likes to add a twist of lemon to the glass, so maybe they have a similar flavour in their batch too. I got a stuck sparge in the Grainfather and needed to rescue it with the BIAB bag (it was on standby). Oh, and it is CLOUDY! I have recently brewed this recipe with tettnang bittering hops and HBC-431 at flame out will a quick chill to 170f and a 30 minute steep. With Secondary 3 gallons went in to dry hop with a Oz of saaz. 1.5 gallon went in to secondary with a quart of red raspberries. Kegged both batches today. Saaz batch has a little tartness to it but good taste and a lot of body. Raspberry batch has picked up some color and nice raspberry taste. I think both will condition nicely and be very good hot weather refreshers. This is always on tap during the summer. I use 2lbs rye instead of 1. Plus I add an extra ounce of citra at 1 minute in the boil, then dry hop with another ounce of citra. This is a true lawnmower beer.